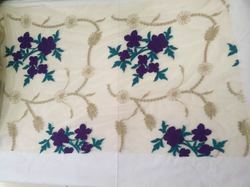 Exclusive design range in net embroidered fabric is available. Extremely fine embroidered net fabrics has been used as a base for gowns and exhibits intricate and beautiful design that has floral patterns. Silver metallic yarn, lace and beads have been expertly placed by the craftsman to add grace to the gown. The design makes the gown look feminine and adds a soft touch thus is an ideal gown for any bride's special day. We are the prominent manufacturer and exporter of Net Embroidery Silk Fabric, these are known for their unmatched quality and unbeatable price in market. 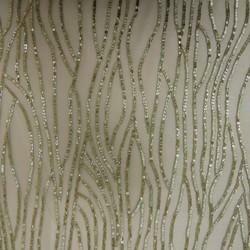 Our client can avail these net embroidery fabric at affordable price in market. we are the exporter of best fabric. Our reputation in this industry has largely been counted by the shooting popularity of our offered Modern Net Embroidery Fabric.